The newest class is “Cooking for Recovery.” It is connected to the spreading belief that many forms of treatment are needed to recover from drug and alcohol dependency, also called addiction. “Mood enhancers” — vegetables and whole grains — sat on the side on one side of the table. “Mood depressors” — foods with a lot of sugar — sat on the other side. In this Thursday, March 15, 2018, photo, a selection of whole grain and healthier food options are displayed during a “Cooking for Recovery” class at the Boston Medical Center in Boston. Young said the hospital’s addiction treatment program has helped her return to normal life. But she said she had not considered how healthy eating could affect her until she attended the class. 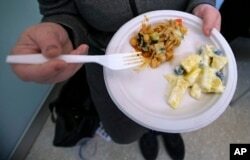 In this Thursday, March 15, 2018, photo, a patient in recovery holds up a plate of food created by registered dietitian Tracey Burg. That may change. New Hampshire’s Dartmouth-Hitchcock Medical Center has taken note of the cooking classes. Its addiction treatment program for pregnant women and mothers includes a food store. Patients can take home fresh fruits and vegetables after recovery group meetings. “They’re not eating a lot of nutritious food.” She also said the women often arrive hungry and will eat the fruits and vegetables that are available.